Deep-frying your food in peanut oil will give your meal a light, somewhat nutty flavor. Deep-frying is a fast, easy way to make relatively healthy meals, particularly when you use peanut oil instead of animal fat. Major fast-food chains in the United States mainly use refined peanut oil to cook menu items like French fries and corn dogs, according to the Peanut Institute. You can make these same foods at home, using peanut oil in your own deep-fryer. Food is best when deep-fried at a constant temperature of 375 degrees Fahrenheit, according to the Chef Geir's Culinary Resources website. Cooking at high temperatures results in food that is crispy on the outside and moist on the inside. You can deep-fry at very high temperatures when using peanut oil because it has a high smoke point of approximately 448 degrees Fahrenheit. Other types of oil suitable for deep-frying because of high smoke points include avocado, mustard, corn, palm, soybean, sunflower and safflower. Peanut oil does not absorb the flavor of foods cooked in the oil, so you can use peanut oil to deep-fry several different items and each will retain its own unique taste. 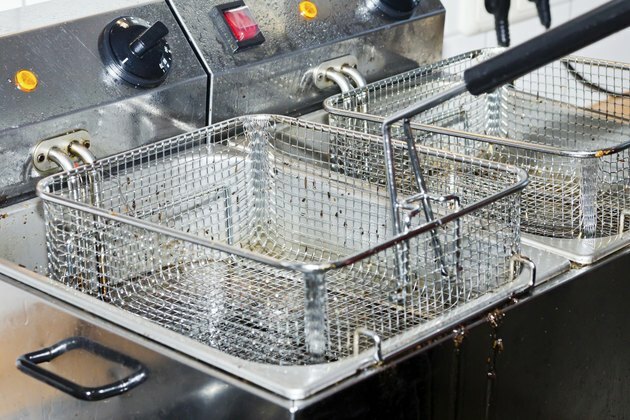 Deep-frying at high temperatures with the correct oil does not make your food greasy because high temperatures cook the outside surface of your food quickly. Moisture from the cooked food repels oil, preventing grease from penetrating your food. Deep-frying food at lower temperatures allows oil to seep into your food, making your meal greasy. Peanut oil is a healthy alternative to other types of oils. Peanut oil, like other types of vegetable oils, is low in saturated fat and is free of cholesterol and trans fat. Like olive oil, peanut oil is high in monounsaturated fat, which can reduce your risk for cardiovascular disease when eaten as a replacement for unsaturated fats. You might have chosen other types of oil for deep-frying because you have a food allergy. You may deep-fry in peanut oil even if you have an allergy to peanuts, according to the Food Allergy & Anaphylaxis Network website. Manufacturers of peanut oil bleach, refine and deodorize peanuts in a process that removes the proteins responsible for allergic reactions.